Joe has to admit. Bucs cornerback Myron Lewis is living a charmed life. Since being drafted out of Vanderbilt in the third round of what is still considered a very deep draft in 2010, Lewis has been hurt more often than healthy. When healthy, he has yet to establish himself as a reliable NFL corner. 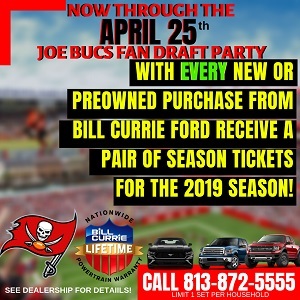 Now some Bucs fans were clamoring for Lewis to get a pink slip by Bucs rock star general manager Mark Dominik for, in preseason games, being the same ole’ Myron Lewis, despite some local scribes suggesting otherwise. If not for presason injuries suffered by Eric Wright, E. J. Biggers and Anthony Gaitor, it’s possible Lewis would have been unemployed. Now, Gaitor is on the injured reserve list and Aqib Talib, who is followed by trouble nearly as much as his shadow, is now suspended (again), this time for four games. The stars have aligned for Lewis yet again. With Gaitor out, Talib suspended and Wright a play away from being dinged up again (he’s currently trying to recover from a head injury), it’s highly possible that Lewis will see significant playing time Sunday in trying to lock up the Chiefs very dangerous receivers, highlighted by Dwayne Bowe. Now is the time for Lewis to prove he can play in the NFL. For if he doesn’t, Joe’s pretty sure Lewis won’t be with the Bucs in 2013. Dear god no. Are really we that desperate? Might as well put Trueblood out there at corner. I don’t care who the receivers are….Brady Quinn is the QB and he can’t throw the deep ball. Lewis will be fine.